Patent and technology advisory firm Tech Insights has bought and disassembled a brand new Samsung Galaxy S10+ and published detailed photos of its internal components down to each individual chip on the motherboard, along with an estimate of the total bill of materials. Samsung's brand new flagship phone along with the slightly more affordable Galaxy S10 and Galaxy S10e as well as the forward-looking Galaxy S10 5G was unveiled at an event just ahead of this year's MWC trade show last month. The three Non-5G variants have already been announced in India and will go on sale starting from March 8. Prices start at Rs. 55,900 for the entry-level Samsung Galaxy S10e and go up to Rs. 1, 17,900 for the fully loaded Samsung Galaxy S10+ with 12GB of RAM and 1TB of storage. Tech Insights was able to purchase a Korean Samsung Galaxy S10+ unit to tear apart. According to the firm, the total bill of materials for hardware alone comes to $420 (approximately Rs. 29,462). That does not include Samsung's costs for research and development, shipping, marketing and advertising, staff, and all other overheads. The chief contributor to this total is the large 6.4-inch Quad-HD+ Infinity-O display with its cutout for the phone's two front-facing cameras, which comes in at an estimated $86.50. That component is followed closely by the Exynos 9820 So, developed in-house, which is estimated to cost $70.50 per unit. Although it is newer, Tech Insights estimates that it costs Samsung about $10 less to manufacture than the Exynos 9810 processor in last year's Samsung Galaxy S9 Rs-46,000(Review) models, thanks to the falling prices of silicon wafers over the past year or so. 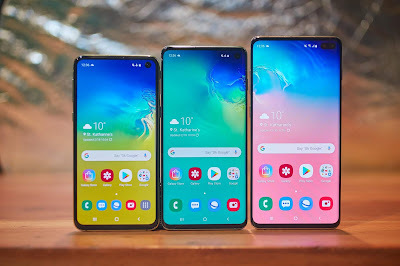 Also, while the outlay on RAM and storage seems to be the same between the two generations of phones, the newer Samsung Galaxy S10+ has 8GB of RAM and 128GB of storage while its predecessor had 6GB and 64GB respectively.